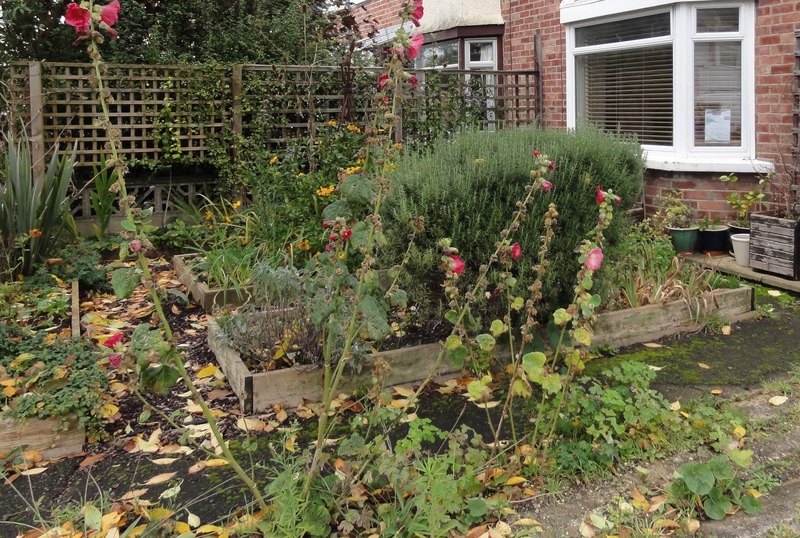 The front garden definitely has an autumn-winter feel. Mainly winter, since autumn passed us by. Though so did summer, and much of spring. Maybe it's just been one long winter for the last year?! The garden hasn't had much attention in the last month or two. I've had lots of problems with my back so gardening has been limited to absolute essentials, such as getting the garlic in at the lottie. However, despite the lack of attention, it doesn't look "too bad". I'm pleased that the raised bed structure with the paths holds it own even when I'm unable to tend the front garden much. I've had a couple of surprises. 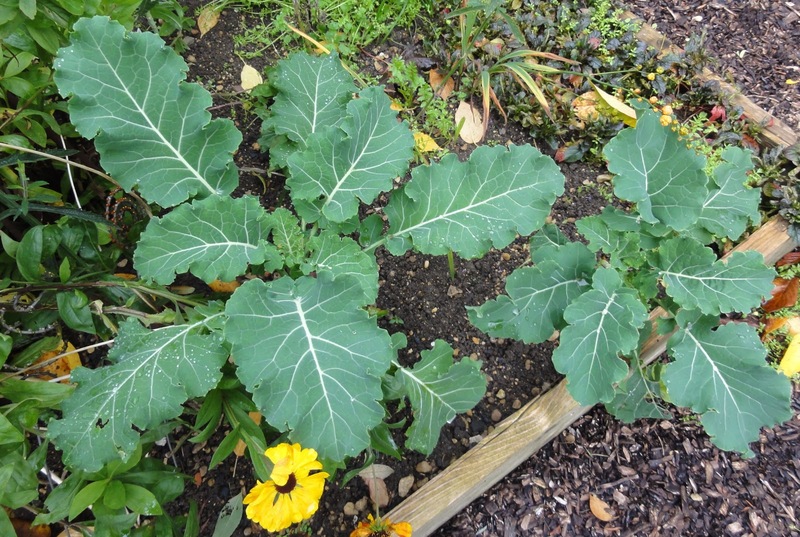 My Daubenton (perennial) Kale was starting to do well again in August, but then I did notice that it was seriously attacked in September-October by white cabbage caterpillars and they were looking like on their last legs. But as you can see from above, the cold weather has saved them and they are growing well again. 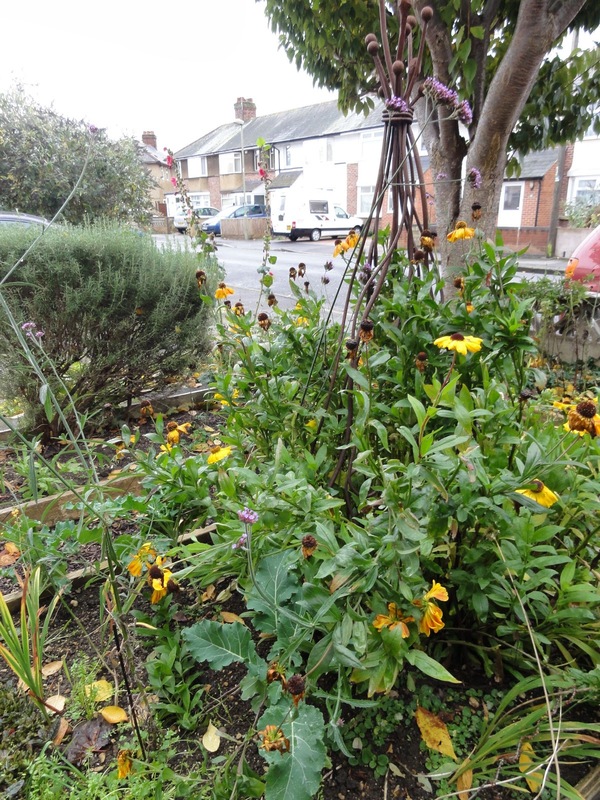 They are not as big as they should be at this time of the year, as they are shaded by the large patch of Heleniums in front of them. It does show kale will grow in shade, but of course, much slower. I'm planning on moving plants in this bed so that the obelisk/heleniums will be at the 'back', closest to the house and so reduce the shade they cast. 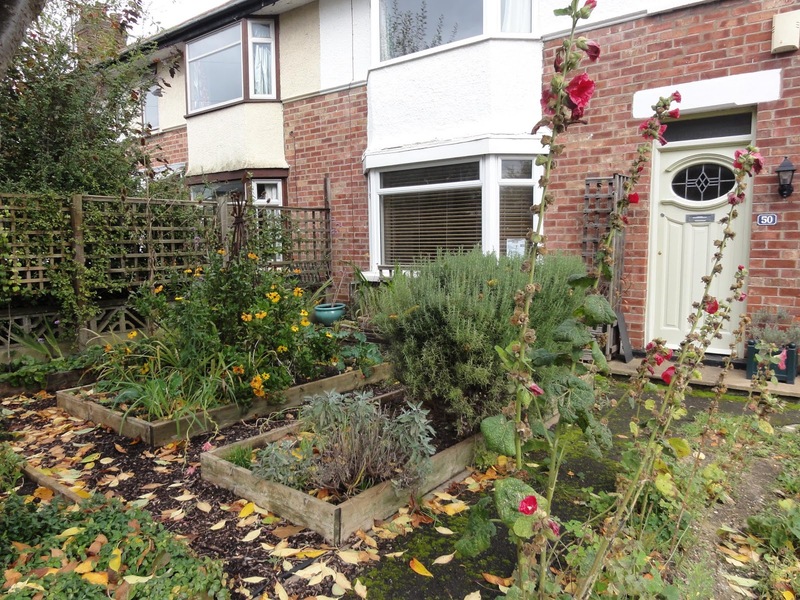 Then the plants can make more of the sun with the space in front. 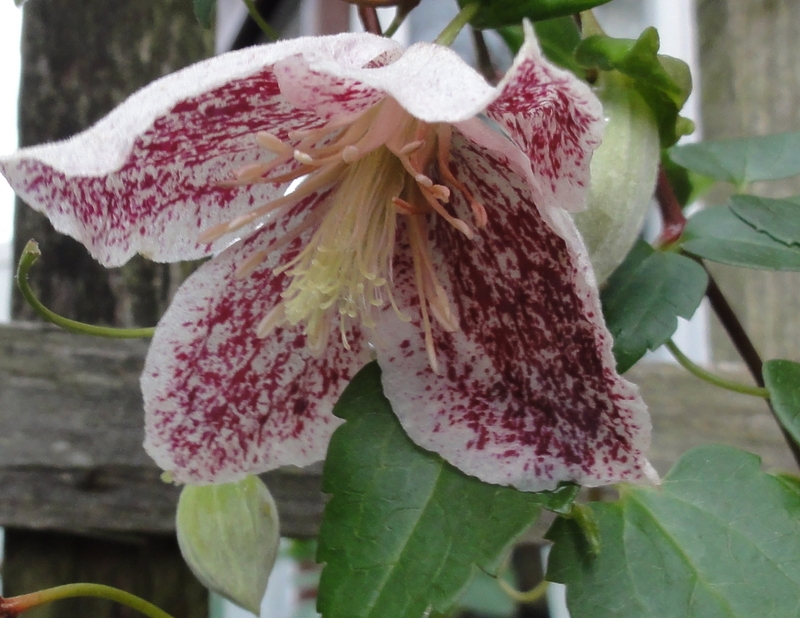 The other lovely surprise was that my Clematis Cirrhosa Freckles has just started flowering! I love this clematis. It flowers in the darkest part of the year and is so pretty with it's maroon freckles and the way it nods gently in the wind. The pear trees (Beth, below) have grown quite a bit. You can now start to see some structure with two levels of espaliered tree, plus the central stem is getting quite tall. 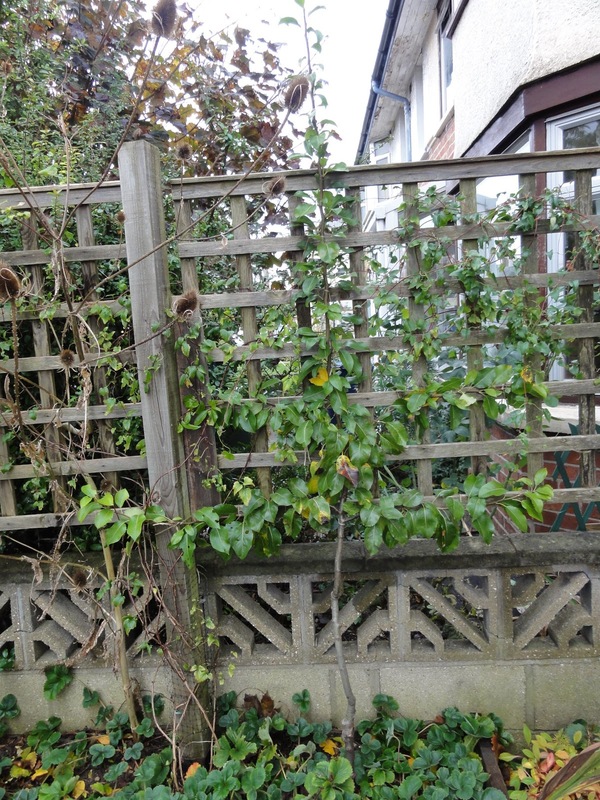 I'll prune this all back in January to continue to develop the structure I'm looking for. Hoping next year I might get some fruit! It's looking a tad untidy with the leaves all over the place, but I don't mind. 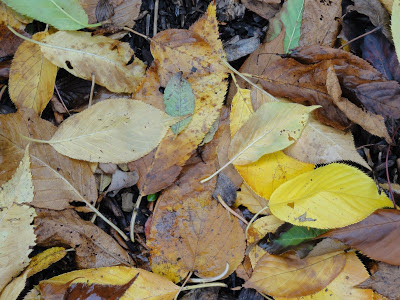 I love the colours as they fall and break down, these leaves from the flowering Cherry tree. I will collect them up to make leaf mould once my back is better. In the meantime, rather than thinking of them as 'untidy', I'll enjoy of them as lovely 'leaf-snow' colours on the ground. 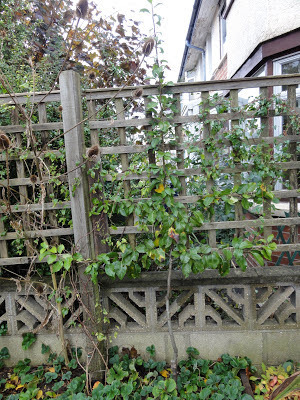 Nice post, the Clematis flower looks fabulous.